Commander Stacey O’Neal, United States Navy, was born and raised in Greenville, Mississippi. She is the oldest daughter of seven children to Charles O’Neal and Gwendolyn Peques of Pascagoula and Greenville, Mississippi respectively. In July of 1994 she enlisted in the Navy and was assigned to Recruit Training command, Orlando, Florida for Boot Camp, then assigned to Great Lakes, Chicago for Machinist Mate (MM) “A” School. Upon completion of “A” school, she joined the crew of the USS PLATTE (AO) 186 until December 1998. In January of 1999 Lieutenant Commander O’Neal was assigned to the Cryogenics Shop aboard USS JOHN F. KENNEDY (CV 67) in Mayport, Florida where she was accepted for commissioning through the Enlisted Commissioning Program (ECP). Upon completion of her Bachelor of Education from the University Of North Florida (UNF) and earning her commission, in May 2004, she reported to USS CHUNG-HOON (DDG 93) home ported in Pearl Harbor, Hawaii, as the Mine Warfare Officer. Her second Division Officer tour was USS HUE CITY (CG66) stationed out of Mayport, Florida as the Training Officer. Her shore assignment was Surface Warfare Officers School Command (SWOS) in Newport, Rhode Island to teach Conning Officer Virtual Environment (COVE). Upon completion of her tour at SWOS, she was given a year sabbatical. During this year she completed her Masters of Science in Personnel Management from Salve Regina University and Joint Military Professional Education (JPME Phase I) through distance at the Naval War College. After completing Department Head School in December 2011, she was assigned to USS DONALD COOK (DDG 75) out of Norfolk, Virginia as the Engineering Officer. After completion of this tour she was assigned to Littoral Combat Ship Crew 212 in San Diego, California as the Operation Officer from May 2013 to November 2015. 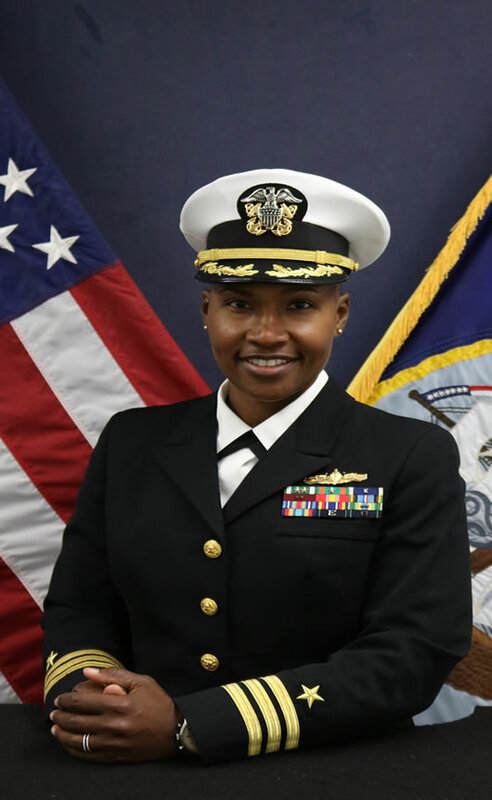 Currently, Lieutenant Commander O’Neal is the Command Qualification Coordinator and Senior Instructor at Surface Warfare Officers School Command.